With a lack of input innovations, what does the future hold for the mouse on a Mac? Apple’s new Magic Mouse 2 isn’t really that much different from the original Magic Mouse. It has major changes that affect how the mouse moves and a new built-in battery. But there’s nothing about the Magic Mouse 2 that will make you ditch your current mouse—even if it’s an original Magic Mouse. The exterior design of the Magic Mouse 2 is almost the same as the Magic Mouse. It’s still has a white plastic sliver that rests atop an aluminum case, with no visible buttons or scroll wheel. Flip the mouse over, and you’ll finally see a difference. The Magic Mouse 2 has a built-in rechargeable lithium-ion battery, so it no longer needs a removable battery cover. Where the latch for the cover used to be is now a Lightning port that is used to recharge the battery. The Magic Mouse 2 (left) has a built-in rechargeable battery, so a battery cover is no longer needed. Charging the Magic Mouse 2. 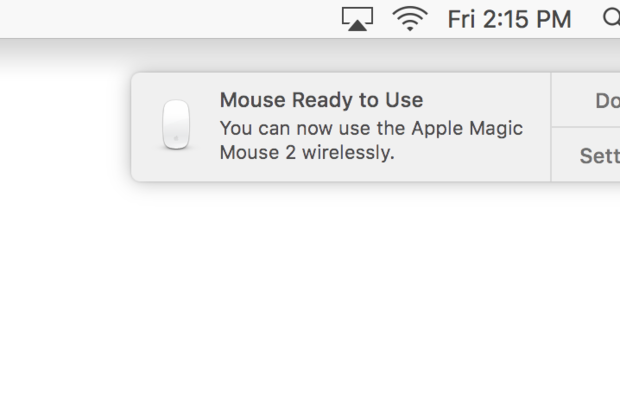 No more fussing with Bluetooth pairing: When you connect the Magic Mouse 2 to your Mac using a Lightning cable (included), El Capitan automatically creates a Bluetooth pairing. The Magic Mouse 2 (top) is lighter than the original Magic Mouse. Much of what I said in my review of the Magic Mouse nearly seven years ago holds true for the Magic Mouse. 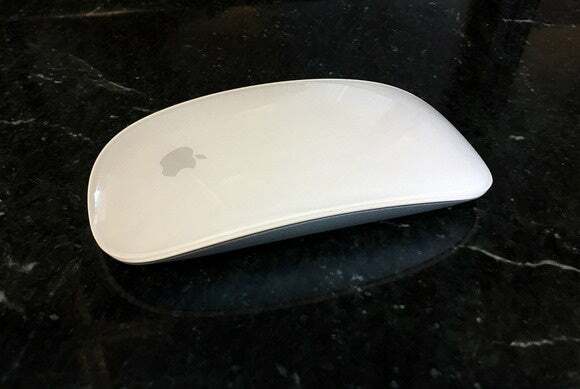 The Magic Mouse 2 has an extremely low profile, so if you like to rest the lower part of the mouse against your palm, you may not be able to do so with the Magic Mouse 2. The Magic Mouse 2 still has only two buttons. For many users, that’s enough, but for some power users, it’s not. There’s no physical separation between the right and left buttons, but I never accidentally pressed the wrong button. When you click a button, the whole top of the mouse presses down with an audible click sound. 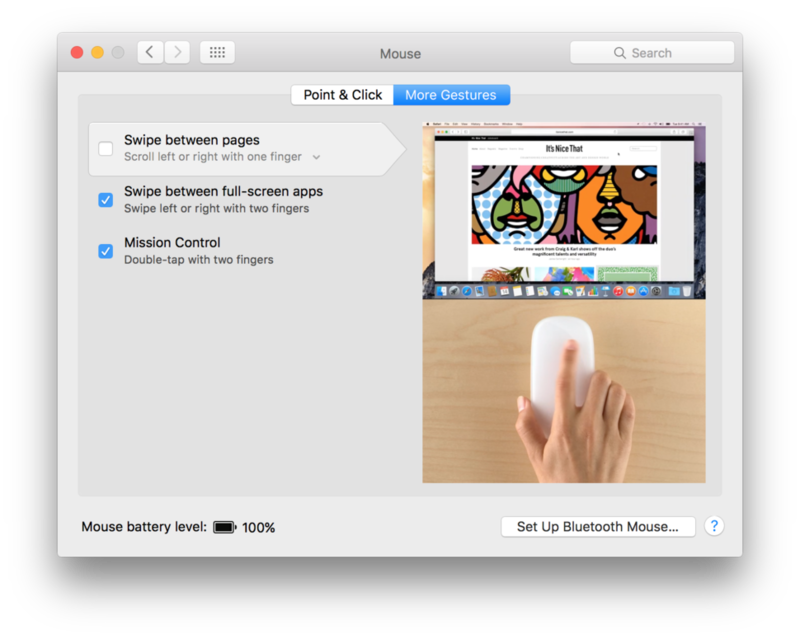 Multi-Touch was introduced in the Magic Mouse, and it’s still in the Magic Mouse 2. Multi-Touch is relied on for scrolling, going forward or back in iPhoto or Safari, zooming, and more but there are no new gestures. In my Magic Mouse review, I wrote, “I’m left feeling that Multi-Touch on a mouse has the potential for more.” Consider that potential still untapped. One pet peeve I had with the Magic Mouse—and thus, still have with the Magic Mouse 2—is that its symmetrical design makes it impossible to tell by touch if the mouse is positioned with the optics at the top. I move Macs around a lot in the Macworld offices, and if I had a dollar for every time I started using a Magic Mouse upside-down, I’d probably be able to buy a new Magic Keyboard and still have cash left over. Magic Mouse 2 requires OS X El Capitan and Bluetooth. I tried to connect to a Yosemite Mac to see what would happen, and the Mac didn’t recognize the Magic Mouse 2 at all. The Multi-Touch gestures that were introduced with the original Magic Mouse are still available with the Magic Mouse 2. Could the Magic Mouse 2 support Force Touch? Probably not in its current state. I don’t know what it would take to implement force touch sensors underneath the top the Magic Mouse, but I’m sure it’s not a trivial task. Apple's Magic Mouse 2 (bottom) and the last wired mouse Apple made, the Apple Mouse (top).